*Only one discount offer can be redeemed for each week of enrollment. ​**Email nemawushu@gmail.com to redeem multiple week discount. Must enroll 4 weeks at once. *** Current NECWA students, are students enrolled in the current year's Spring session. One discount offer per week. Ongoing till end of summer. Cancellation policy: No refund given to any cancellation that is received less than 6 weeks before the Monday of each week. Rosters for most of our weeks fill up, so we do this to ensure that everyone commits to the limited spots available. In this way everyone has a fair opportunity to enroll in the weeks that best work for them. 1) Paypal: nemawushu@gmail.com. Payment amount should reflect any ongoing discount offers. 1b) When paying via Paypal please select "Friends and Family", we try to keep our tuition as low as possible by minimizing transaction fees. We will send you an invoice if desired, and you will receive a receipt when payment is received. 2) Venmo @NEWUSHU, payment should reflect any ongoing discount offers. 1) Email us to schedule a phone call and we can enroll and complete payment. 1) Fill out the form below. Select pay in person with check/cash when filling out registration form. 2) Pay in person at 123 Muller Rd Burlington, MA 01803. Payment amount should reflect any ongoing discount offers. 2) Add the desired enrollment options in the cart below. 4) Register/Login account and select desired payment method. 1) What do i need to prepare when participating in activities at NECWA? For the most part, we require comfortable attire appropriate for physical activity when enrolled in our martial arts/Wushu program. It may be advisable to bring an extra change of clothes if needed. For Wushu weeks, please be sure to pack lunch, water and snacks (as needed). For our regular classes, we require all students to wear their academy uniform and sash. 2) What payment methods are accepted at NECWA? We accept PayPal (nemawushu@gmail.com), Venmo (@NEWUSHU), Check (payable to NECWA), Cash and Card payment (via our virtual terminal). 3) What is NECWA's refund policy? 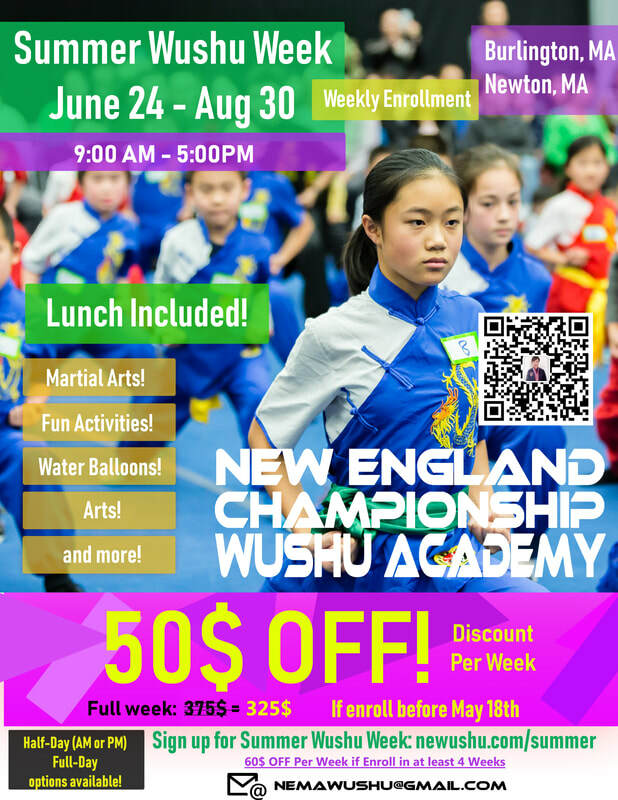 New England Championship Wushu Academy has a no-refund policy for all tuition and fees for classes. During Wushu weeks, we will consider partial refunds at the discretion of our directors (Calvin and Xiaoyi) if you miss more than half the week due to sickness or other emergencies. We will need appropriate documentation (e.g. physician's note). Cancellations of Wushu weeks (Winter, Spring, Summer) require 4 weeks of advanced notice before the first day for full refund.